‘Hand of the Morningstar‘ is an American-style superhero miniseries released in black-and-white tankobon (which is usually the method of Japanese manga). 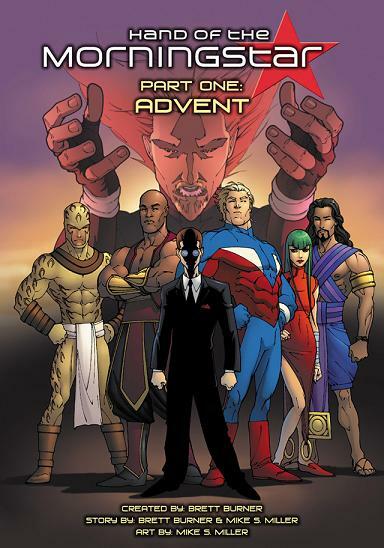 Created by Brett Burner of Alias Enterprises (which publishes other Christian based comics), I can best describe the series as ‘superhero take on the End Times’, with references and plot twists that those familiar with the Bible will be able to pick up on if they think a little bit. The art is by Mike Miller, and bears a resemblance to the first two Ultimates drawn by Bryan Hitch (hence my filing this under Ultimate Marvel Moments, lol). You can read the comic online here, at least up to the point it’s been updated thus far, or buy the several tankobons online. This entry was posted on April 17, 10 at 10:51 am and is filed under Ultimate Marvel Moments, Webcomics. You can follow any responses to this entry through the RSS 2.0 feed. You can leave a response, or trackback from your own site.